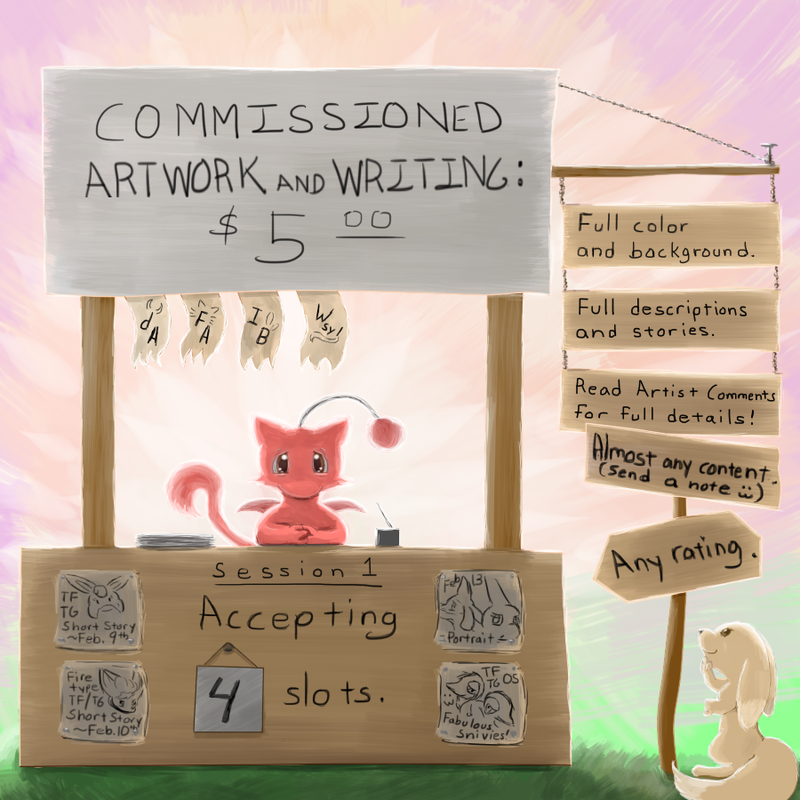 The one who 'scapes that fluffy, ever-transforming Mew (apparently, now donning a pair of Moogle wings and a pom-pom) now accepts commissions for artwork and stories! Psychiatric help not included. Please send a "Note" if interested in reserving a commission. Make sure you provide a good reference and description. Session 1: This is an "experimental" phase. I will accept up to four slots for projects, between all websites where this will be posted. One project per person (unless a slot is still free after a commission is completed). 4. Project: Double Snivy TF/TG/OS ~ Estimated Completion Date: ?? - Standalone composition: A fully-colored, shaded, completed work, with a single character and relatively simple background. $5.00, or 400 points (dA). - Sequential artwork (i.e. comics): A fully-colored and shaded sequence, with or without text, with a single character and relatively simple background. A single page. $10.00, or 800 points (dA). - Additional characters: Having more than one character present in the image, still complete with full colors, shades, and background. +$5.00, or 400 points (dA), per additional character. - Additional pages: More than one page of a particular artwork sequence or comic, continuing the same concept or idea from the previous. +$5.00, or 400 points (dA), per additional page. - Stationary avatars: A 50x50, or 100x100 pixel full-colored avatar for use by the commissioner. Non-animated. $1.00, or 80 points (dA). Minor project, does not take up a slot. - Vignette: A vignette, or a single scene, thereabouts 1,000-to-2,000 words. Not necessarily a full story; just part of one. $2.00, or 160 points (dA). - Short Story: A complete single story, with a full scenario, thereabouts 3,000-to-5,000 words. Complete plot and characters. $5.00, or 400 points (dA). - Sequels, Continuations, Chapters: A follow-up to any short story completed, or ongoing sagas. Again, a full scenario, thereabouts 3,000-to-5,000 words. Complete plot and characters, or continuation thereof. You must be the commissioner of the original work, or, if not, have the commissioner's consent to continue a previously completed work. +$5.00, or 400 points (dA), per additional installment. I'm receptive to most subject matter (no, seriously, you'd be surprised; send a note if you are doubtful :3). However, I do reserve the right to decline any proposed project, for whatever reason. I also will decide where the final project will be posted. Picture references are the way to go. Though both picture and text references are acceptable, it's far easier to get a character on-model based on a picture, as opposed to a reference with all text. I accept US dollars through PayPal, and/or point-currency used on deviantArt. I am open to other compensation, though, if you have any to propose. Please only send payment once (if) I have accepted your project. If, for whatever reason, I must cancel your commissioned project, you will be promptly notified and refunded. Once a project is accepted and paid for, you can expect to have the completed work posted anywhere between three-to-fourteen days. I will set a date of completion for your work, and I will notify you upon posting. Your commissioned work will posted wherever I am active, whatever website it will be accepted. You may request your work to be withheld from a particular website if you so state it. Additionally, you may request your name to be withheld if you so desire. If you feel you need an edit made to your commissioned project, please let me know. One request for edits per project, please. After that, the work is final. looking forward to more slots opening. I missed these ones..
Well, provided this experimental session of commissions is successful, I will open up slots again in two-or-three weeks. :3 Hope to see you around!